Birds of prey, raptors, hawks, eagles, owls. You name it. Hunting these predators down with the camera is a big part of the thrill for me. Fairborn Marsh, Fairborn, Ohio This was my first ever encounter with a hawk of any type! 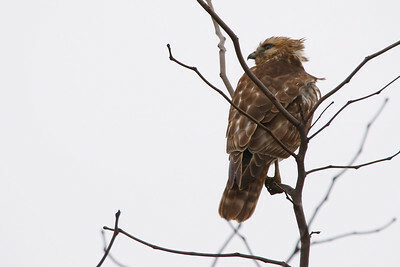 These have been referred to as "Marsh Hawks" due to their tendency to reside near wetter habitats. A little fun fact is their memorable call can be heard mimicked by Blue Jays. Pitch perfect. In this case it cearly heard and/or saw me before I could see/hear it. Like a game of cat and mouse, I followed it from a patch of woodlands near a marsh wetland towards a fairly busy road near the location and around to a prairie where it stood high and mighty as seen here. This lasted for a few minutes giving me enough time to fire off a round of photos, this particular being my favorite. By the time it took off again my heart was racing. The first time encountering a new bird species is always exciting to me. Although I stress that one should never put the welfare of the animal in danger, so chasing it like I did is not always the best: learn when to back down. As you can tell, the day was very cloudy and bland so the background gives the image a high key approach. Overall I am pleased with the outcome and perhaps more important the experience. © 2018 Ryan L. Taylor Photography. All Rights Reserved. Beavercreek, Ohio "It is within nature that I simultaneously lose myself and find myself at the same time." One of my final captures of 2018 on a chilly December at high noon. 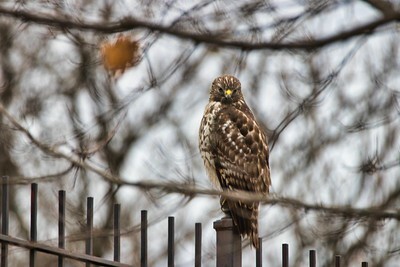 This hawk was spotted in my backyard perched on the bird feeder poles I have set up. While this was my first glimpse of it, I am under the assumption that it flushed out any songbirds at the feeder a while before I found it. This is an image that I would've never of gotten if it weren't for my watchful brother. Another happy accident. I was about to take a shower when he yelled about a hawk in the backyard. Wearing the lightest of clothes and no socks or shoes. I rush into my living room office to grab my 150-600mm and a camera body. 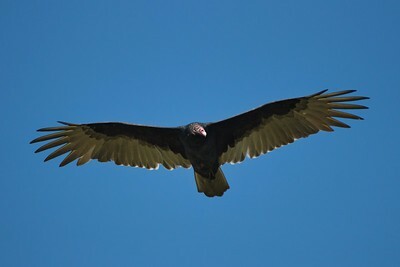 Without a second thought I rush to the back room and see it fly towards the next backyard away from ours. 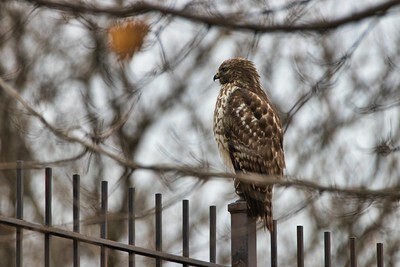 Though I was told the hawk had a mouse in its talons, I can't be too sure. In the next backyard it perched on this old installed pool fence where it gave me a nasty look and stayed around for a few minutes before taking off. Raptors come around my backyard from time to time like this. My brother can take all the credit for this one. One thing to note is the way the focus drops out in the background. To me this conveys the dizzying feeling I had trying to take the shot before it got away. I find the bokeh very pleasing in this application. Overall the complimentary earthtone colors work well. A lesson learned, be quick on your feet for any photo opportunity as they arise. Also it pays off to know your camera in hand and to know your gear and settings well enough to work under pressure. Without quick thinking of the dials and switches this would've been a blurry waste of an image. Knowledge is power. © 2018 Ryan L. Taylor Photography. All Rights Reserved. Beavercreek, Ohio This hawk was spotted in my backyard perched on the bird feeder poles I have set up. While this was my first glimpse of it, I am under the assumption that it flushed out any songbirds at the feeder although I was told the hawk had a mouse in its talons. Quickly grabbing my telephoto lens, I managed to see it fly further away to the next backyard as it perched on this pool fence where it gave me a nasty look and stayed around for a few minutes before taking off. Raptors come around my backyard from time to time like this. The lesson is that it pays off to be quick on your feet, camera in hand and to know your gear and settings well enough to work under pressure. © 2018 Ryan L. Taylor Photography. All Rights Reserved. Narrows Reserve, Beavercreek, Ohio A very early raptor shot in my career. 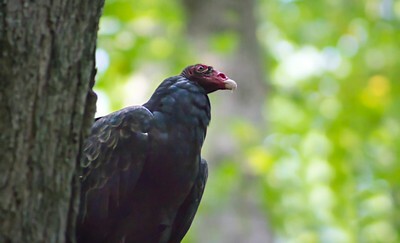 I was heading back to my friends vehicle with a friend after an afternoon walk when this Turkey Vulture startled both of us as it flew from behind a dead fallen tree trunk and landed atop a neighboring tree branch. For several minutes we stood taking a barrage of shots as it posed for us almost like a fashion model. It is not too common to see this bird perched like this unless it were sunning out its' wings. The vulture moved positions several times and after a few minutes left the area. The very menacing look it gave us from this close was apparent. This moment was one of several that began my interest in bird photography and specifically raptors. Up to that point I had not really seen a bird this big up close and personal in the wild yet! The experience had my heart racing and made for an interesting story until it was over. © 2016 Ryan L. Taylor Photography. All Rights Reserved. Narrows Reserve, Beavercreek, Ohio While technically not raptors or birds of prey, Turkey Vultures feed on carrion, such as already dead rodents, smaller mammals and roadkill. The true classification of raptors would be given to birds that hunt for their own food. 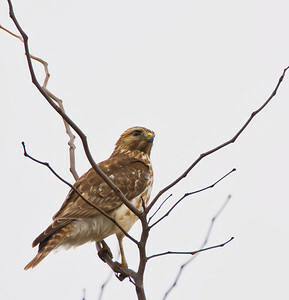 This is a shot of a rather steely-eyed one that was resting while perched in a tree. © 2016 Ryan L. Taylor Photography. All Rights Reserved. Huffman Metropark, Dayton, Ohio "Bird, beast, man and flower, we're all one flesh.” - Marty Rubin March 3rd is World Wildlife Day and so we should remind ourselves how integral animals are to this world. Without them, we really wouldn't exist. For example, bird migrations and populations are some of the first indicators for climate change we look towards for research. 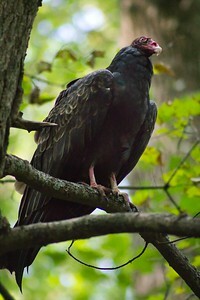 Turkey Vultures are nature's janitors: they feed on roadkill and carrion left behind from other predators. If these birds didn't exist, we would have a lot of rotting carcasses to pick up otherwise. This image was taken during my first visit to Huffman. It was approaching mid-morning and I had almost exhausted my search for images. One last area I had yet to explore was the Huffman Dam. I sought to make a trek up to the top with the now midday sun peering over. Not able to find a compelling landscape composition, I instead found my attention turn towards about a dozen turkey vultures soaring not too high above my position at the top. Shooting in burst mode, I made sweeping motions from side to side with my gimbal tripod head and managed this portrait of one in flight. Within a couple of minutes, they were already way out of range even for my telephoto as they kept soaring on the hot air thermals. To me, it is indicative of the Huffman's area for aircraft and the invention of flight. The area is rich with aviation history and to see impressive birds such as Turkey Vultures and Bald Eagles in flight here is simply inspiring. Nothing is more impressive to me than that sense of freedom. © 2018 Ryan L. Taylor Photography. All Rights Reserved.